I hope you all are enjoying the herbs you dried over the past summer; I certainly am. If you didn't dry any or you don't know how next weeks post will be about preserving your herbs so you can save some money next year by making your own herb mixes. 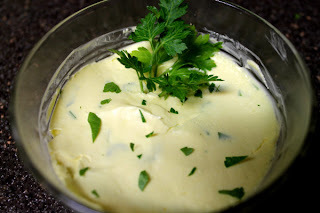 One of my favorite ways to use my dried herbs - fresh ones too - is in herb butters. I actually used a butter substitute made from Olive oil ( Smart Balance) but real butter works too. Bill has a triple heart by pass so we avoid butter when we can. 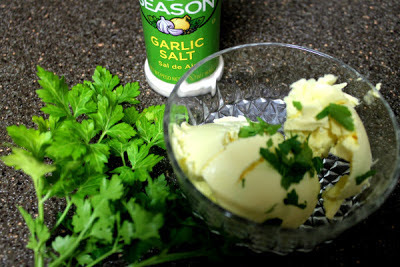 Pictured above is the start of garlic/parsley spread and here is the finished product all ready for the table. Mix all together, press into a bowl or butter mold if you have one,chill to firm the mix a little, add a spring of fresh parsley for a pretty garnish. Yummy on Italian bread with soup! This next one is good on sourdough bread and compliments Chicken dishes and dried beans. BTW: Rosemary is wonderful added to dried navy beans while cooking. I found this next one on TipNut web site. It is for bulk dill spread. I like the idea of making butter balls with a melon ball tool and freezing them for later use. Scoop balls or slice into pats then freeze. If you have a favorite Herb recipe, please post it in our comment section and be sure to leave us a link to your site if you have one.